Whispers in the Loggia: They Did... Or Did They? Even if yesterday's USCCB response to the latest version of the Federal contraceptive mandate's religious opt-out was headlined by the conference's judgment that the proposed exemption "falls short" in addressing the church's concerns on religious liberty, the bench's head is apparently keen to have few liberties taken when it comes to reporting the line – at least, as he sees it. 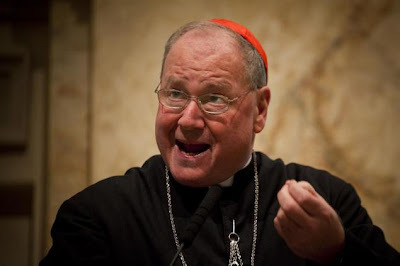 On a quick side-note, this is the second time in a week that an American cardinal has taken to his own blog to rebut a significant story... as watershed moments go for Catholic new media, well, there you have it. Though Dolan's lament of "some news reports" cited only the New York Times' story run in today's editions – which ran with the headline "Bishops Reject Birth Control Compromise" – for good measure, it bears noting that the "reject" lede was identically employed by outlets ranging from Politico, Reuters and Religion News Service to National Public Radio... and, sure enough, even the cause's most likely allies at Fox News. On both sides of the ideological coin, meanwhile, most Catholic commentators likewise took little time before either exulting or foaming at the mouth in reacting to the USCCB statement as a close of the door on the White House's latest attempt at "accommodation." In any event, much as the substance of yesterday's statement can easily be debated, its invariable corollary apparently remains Breaking News to many in the chattering circles: what's known among the church crowd as the "Dolan Two-Step" – a dance in which nobody's left completely hanging... and, indeed, there's always sufficient space for still another shoe to drop. Along those lines, it'd seem this one ain't done just yet. Time, however, is beginning to run short – 13 months since the freedom fight was initially joined, the mandate's grace period for faith-based groups is slated to cease and the rules take effect this August, while (at least, as the conference statutes presently stand) Dolan's non-renewable three-year presidency, the national post's first-ever stint in New York, ends in mid-November.